Moris, Mi casa es tu casa (My house is your house, detail), 2010, mixed media, dimensions variable. Installation view. 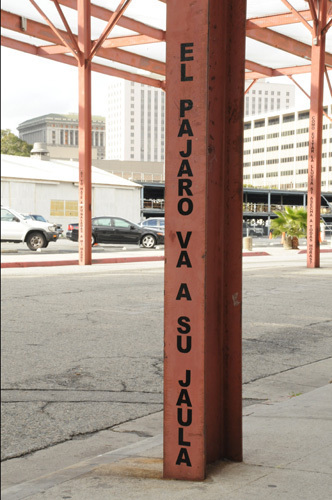 For a new installation commissioned by the Los Angeles Nomadic Division (LAND), the Mexico City–based artist Moris inscribed the contents of a letter from the United States government—denying his application for a work visa—on an exterior wall of the Museum of Contemporary Art. In a deft use of appropriated text and site-specificity, oversize letters make the ubiquitous, even rote, into a monumental force. Despite the large population of Mexicans and Mexican Americans in Los Angeles, it’s likely that many Angelenos rarely consider the impact of such a letter on individual lives and families, a narrative writ large on the imagination in view of the magnified text. Near the missive are short phrases in Spanish rendered on the steel poles supporting the outside patio. These range from the pithy COMER O SER COMIDO? (Eat or be eaten?) to the mysterious EL PAJARO VA A SU JAULA (The bird goes to his cage) and include enough references to travel and danger to indicate the passage north made by many Mexicans, with or without a visa. On the floor of the museum entryway are a series of portraits. Initially invisible, these images are designed to collect dirt from the shoes of passersby, and faces have begun to emerge, peering up from the ground in smoky gray and white. Notably, all aspects of this installation can be viewed before paying and entering the museum, so the work is essentially free, fluidly continuing the artist’s insightful questioning of the literal and figurative parameters of inside and outside.